Summertime offers us plenty of opportunities to spend time out of doors with our Sunday Church School students or other children. While we are outside, whether with children or alone, let us be careful to take time to look at the world around us. Let us not just see God’s workmanship, but let us take time to actually notice it! 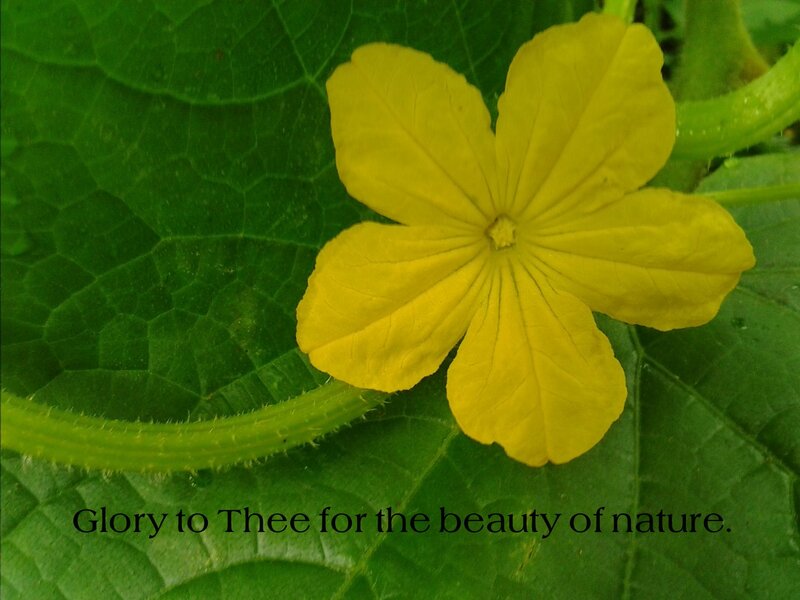 Let us marvel at the beauty, wonder at the intricacies, and find God in His handiwork. As a rule, our busy society has removed “time to smell the roses” from our schedules. The change in schedule that summer offers grants us the opportunity to actually take back that time, and to teach the children in our care to do the same. Let us teach children to love creation. “Love all creation, the whole of it and every grain of sand within it. Love every leaf, every ray of God’s light. Love the animals, love the plants, love everything. If you love everything, you will perceive the divine mystery in things.” ~ Starets Zosima, in Fyodor Dostoevsky’s The Brothers Karamazov. To some degree this comes naturally to children. After all, they are usually the ones bringing a crumpled flower (or bug!) in their fist and proclaiming, “Look what I found!” Perhaps what we really need here is to allow children time and space to be in creation. Or maybe what we need is for them to (re)teach us to love creation!?! Let us urge children to nurture their sense of wonder. “St Silouan urges us to ‘love every created thing; and emphasizes the beauty of nature. From my childhood days I loved the world and its beauty. I loved the woods and green gardens, I loved the fields and all the beauty of God’s creation. I liked to watch the shining clouds scurrying across the blue sky.’ If we lose our sense of wonder before the beauty of nature, so he believed, this suggests that we have at the same time lost our sense of God’s grace.” ~ Metropolitan Kallistos (Ware). Read more at http://www.bogoslov.ru/en/text/2314168.html. I don’t know about you, but my very being sighs in delight as I wander (and wonder) in a woods. God’s creation is filled with wonder. We must not miss it; and it is imperative that we nurture it in the children’s lives! Let us encourage the children in our care to treat all living things with compassion. “The compassionate love of St Silouan extends beyond animals to plants: ‘Hurt not the earth, neither the sea, nor the trees’ (Revelation 7:3). On one occasion when the two of them were walking together, Fr Sophrony struck out with his stick at a clump of tall wild grass. The Starets said nothing, but he shook his head doubtfully; and at once Fr Sophrony was ashamed. In his own writings St Silouan says: ‘That green leaf on the tree which you needlessly plucked – it was not wrong, only rather a pity for the little leaf. The heart that has learned to love feels sorry for every created thing.’ Nurturing care for even the smallest of God’s creatures will help children to be more compassionate and better people! Respect for others and for God’s creation go hand in hand, and should be taught together. Let us learn from the lessons that God has for us in nature. “When you walk in a forest, garden, or meadow, and see the young shoots of the plants, the fruits on the trees, and the variety of the flowers of the field, learn a lesson from God’s plants–namely, the lesson that every tree each summer unfailingly puts forth at least one shoot of considerable size, and unfailingly grows in height and dimensions. It seems as though every tree endeavors each year to advance by the strength that God has given it; therefore, say to yourself, I, too, must each day, each year, absolutely grow higher and higher morally, better and better, more and more perfect; must advance on the road to the Kingdom of Heaven, or to the Father which is in Heaven, through the strength of our Lord Jesus Christ and His Spirit dwelling and working within me. As the field is adorned by a multitude of flowers, so should the field of my own soul be adorned by all the flowers of virtue; as the trees bring forth flowers and afterwards fruit, so must my soul bring forth the fruits of faith and good works.” ~ St. John of Kronstadt, My Life in Christ, from http://www.antiochian.org/content/february-6-2013-prayerfulness-sight-nature. Teaching children to notice how determined plants grow amongst rocks; how hard an ant works; how stubbornly birds insist on flying in a biting wind; each lesson can strengthen their faith. Each part of nature gives us the chance to teach the children (and be taught, ourselves) about the greatness of God and how we should respond to it! By “taking time to smell the roses” and actually seeing what God has placed right before our eyes in nature, and by teaching our the children in our care to do the same, we can grow together towards God. Nature offers us the opportunity to perceive the divine mystery in things, to have a better sense of God’s grace, and to have compassion on all living things. The lessons we learn from nature can make us more virtuous and result in stronger faith and good works coming forth from our lives. So, let’s go! Let’s get outside! Let’s see what God has made, and marvel at His goodness! 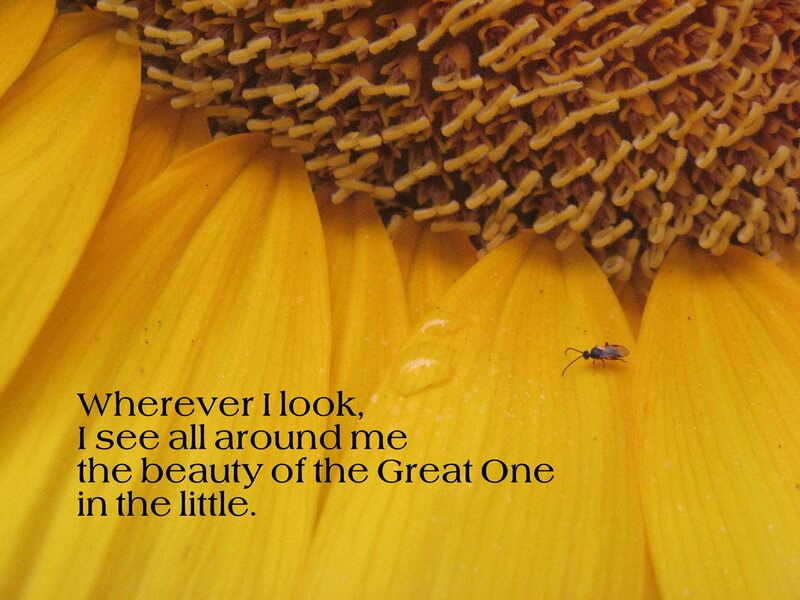 Here are more quotes on the beauty of nature and how it points us to God. Read them for your own encouragement, or discuss them with your students. “Thou broughtest me into this life as if into a wonderful garden. I see the sky deep and blue, the birds as they chirp in flight; I listen to the soothing rustle of trees and the sonorous sound of waters; my mouth is enjoying fragrant and succulent fruits. How wonderful it is in Thy world and how joyous it is to be Thy guest! Glory to Thee for the feast of life! Glory to Thee for the scents of lilies of the valley and roses. Glory to Thee for the abundance and multiplicity of earthly fruits. Glory to Thee for the glistening of morning dew. Glory to Thee for the joyous smile of dawn / with which Thou dost waken me. Glory to Thee for eternal life / and the kingdom of heaven. This entry was posted in Beauty, Nature, Wonder and tagged Beauty, Children, Nature on June 6, 2015 by orthodoxchristianparenting.